What is the HIV Point-of-Care Diagnostics Toolkit? Both were developed in the context of pioneering, catalytic investments made by Unitaid in new point-of- care HIV diagnostic technologies across 15 countries in Sub-Saharan Africa: Cameroon, Côte d’Ivoire, Democratic Republic of the Congo, Ethiopia, Kenya, Lesotho, Malawi, Mozambique, Rwanda, Senegal, Swaziland, Tanzania, Uganda, Zambia, and Zimbabwe. Robust implementation experience across more than 10 countries has served as the foundation for the development of both resources. The idea for this Toolkit emerged as more and more countries began to introduce and scale up HIV POC technologies as a complement to conventional laboratory-based diagnostics. Countries identified a need for tools to support POC scale up, and partners also recognized the need for a common harmonized resource of POC tools that could be used across country contexts. The POC Toolkit will grow and develop over time as new tools to support countries become available. How is the Toolkit organized? Product and Site Selection contains tools to help countries determine which facilities will benefit the most from the introduction of POC testing and to determine the most appropriate type of POC device, based upon available products and their suitability for identified facilities. Forecasting and Supply Planning includes tools and information to help national programs accurately forecast commodity needs for diagnostic services. It also includes information about forecasting and supply planning for new POC diagnostic technologies during the initial program scale up. Regulations includes information about regulatory processes and frameworks for medical devices; product evaluations; national registration of manufacturers and product approval for use; and post-market surveillance. Quality Assurance includes numerous tools covering topics such as quality assured HIV-related POC testing; site certification; site monitoring; as well as costing and budgeting for quality assurance. When introducing POC HIV technologies, countries will need to determine which facilities may benefit most from the introduction of POC testing and which available POC device may be best for the site. Hub and spoke: In this model, the “hub” is the anchor site that provides the POC testing that is extended to additional neighboring sites/facilities (“spokes”).This model requires a reliable sample transportation system to support sample referral. Platform sharing: In this model, a POC platform is shared across different health facilities/sites. Co-location of services: In this model, patients are referred across clinics and service within the same facility (e.g., nutrition clinics, in-patient wards and outpatient services) to maximize the use of the POC device. The selection of POC products should be objective and transparent, deploying the most appropriate products to sites, complementing the existing laboratory network to maximize impact on patient access to testing. POC products should be selected in response to the specific needs, capacity, and limitations of selected sites and the laboratory-clinic network as a whole, as well as to ensure instruments are fit-for-purpose. For countries receiving Global Fund grants, the Global Fund’s Viral Load and Early Infant Diagnosis Selection and Procurement Information Tool is designed to guide countries receiving Global Fund grants with the selection and procurement of viral load (VL) and early infant diagnosis (EID) technologies, including POC diagnostic technologies approved by the Global Fund. It is advised that countries using Global Fund funding to purchase POC diagnostic products discuss their needs with Global Fund procurement as part of the product selection process. Selecting the most appropriate EID and VL products and sites for piloting and scaling up EID and VL point of care testing. Determining the optimal deployment of POC devices and conventional equipment to maximize patient impact while maintaining cost efficiency. It is intended to help technical working groups (TWGS) and stakeholders better understand the current gaps in testing coverage in the country; identify the key country-specific criteria for selecting sites and POC products; and score those criteria to determine the balance between patient volume, access, and price when making decisions about site and product selection. It has been implemented in Cameroon, Malawi and Zimbabwe. For guidance on how to use the CHAI EID and VL Product and Selection Tool, click here. For a version of the tool with sample data click here. It is important to note that accurately completing the tool requires gathering site-level data, national programmatic indicators, and evaluating the relative importance of device performance characteristics. Assembling and cleaning the data can require significant time and sometimes, dedicated resources. CHAI and the African Society of Laboratory Medicine are available to support use of the tool with technical assistance. For additional information, please contact Seth McGovern at CHAI (sethmcgovern@clintonhealthaccess.org). Focusing more specifically on EID, the Elizabeth Glaser Pediatric AIDS Foundation’s (EGPAF) guidance notes (below) are collectively designed to help countries select the most appropriate products and sites to support the piloting and scale up of POC EID technologies, including within the context of a hub and spoke model. The Guidance Note on Product Selection, Facility Upgrades, and Sample Transportation provides consolidated information related to POC EID products as well as some suggestions and considerations related to facility upgrades and sample transportation between spokes and hubs. The Side-by-Side Analysis of POC EID Products contains important information about each POC EID product currently on the market. The Guidance for Site Enrollment provides practical step-by-step guidance on enrolling a POC EID site including pre-installation orientation and planning; installation, training, and start up; and post-installation monitoring and follow-up. 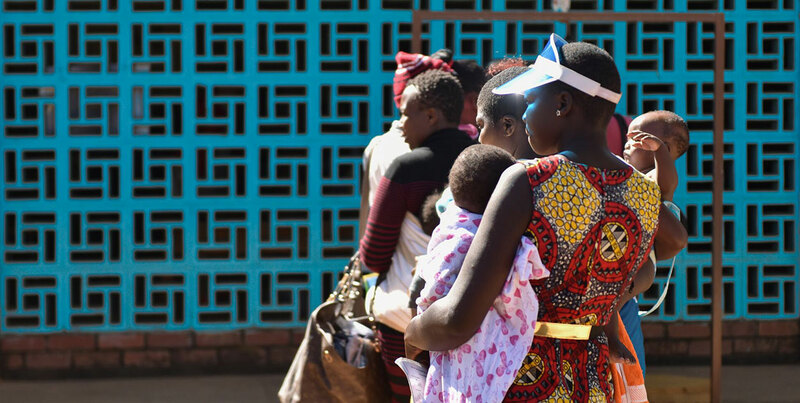 In collaboration with national ministries of health, EGPAF has used these guidance notes to support POC EID pilot and scale up activities in Cameroon, Côte d’Ivoire, Kenya, Lesotho, Mozambique, Rwanda, Swaziland, and Zimbabwe. If you have any questions regarding the guidance materials, please contact Jeff Lemaire at EGPAF (jlemaire@pedaids.org). USAID’s Laboratory Efficiency and Quality Improvement Planning tool (LabEQIP*) is an open-source, geographic information system (GIS) visualization tool intended to assist national programs in developing efficient and high quality laboratory networks. LabEQIP provides data-driven optimization modeling and GIS mapping visualizations. Officially launched in December 2016, LabEQIP has been piloted in Nigeria, Mozambique, and Rwanda and is currently being rolled out on a broader scale. To access the tool and for information about training and support with use of the tool, please contact Jason Williams (jwilliams@usaid.gov) or Dianna Edgil (dedgil@usaid.gov) at USAID. *Developed by LLamasoft Inc. (Ann Arbor, USA) in partnership with the United States Agency for International Development (USAID), the US Centers for Disease Control and Prevention (CDC) and the Supply Chain Management System (SCMS) project (previous USAID-funded project), and is now managed by USAID’s Global Health Supply Chain Program – Procurement and Supply Management Project (GHSC-PSM). Forecasting and supply planning are essential for ensuring the continuity of supplies and minimizing stock-outs. Forecasting involves planning demand based on programmatic needs, allocated funds, consumption and estimated growth, whereas supply planning includes specific details on the quantities of equipment and supplies required, supply chain costs, delivery lead times, and expected arrival dates of shipments. The primary tool in this module is ForLAB, a standardized, open-source quantification tool designed to help program managers forecast commodity needs for diagnostic services. It can be used for both long term and short term forecasts as well as to guide improvements in diagnostic services. For additional information about ForLAB, including access to the latest software and guidance materials, click here. In addition, when a new device or technology is scaled-up, it may initially be necessary to use a mix of forecasting approaches that are responsive to program scale up and rapidly changing deployment plans. For specific guidance on forecasting for new POC early infant diagnosis (EID) and viral load (VL) diagnostic technologies during the initial scale up phase, see Forecasting and Supply Planning for the Scale-up of new POC EID/VL Technologies. Regulatory oversight ensures that in vitro diagnostic medical devices (IVDs) conform to established quality and safety standards. IVDS are devices that whether used alone or in combination, are intended by the manufacturer for the in-vitro examination of specimens derived from the human body to provide information for diagnostic, monitoring or compatibility purposes. Regulatory requirements are in place to prevent sub-standard or poor quality technologies from entering the market and being used for patient care. Global and regional harmonization initiatives. Where local regulatory capacity is limited, global, regional, or other national frameworks can help guide decisions on setting minimum standards, identifying candidate technologies, and registering high quality POC IVDs in country. These frameworks include (amongst others), the International Standards Organization (ISO), the United States Food and Drug Administration (US FDA), Conformité Européene (CE) marking, and WHO’s Prequalification of In Vitro Diagnostics (IVD). Accelerate the approval of new IVDs across multiple countries with minimal duplication of effort. The WHO Prequalification (PQ) of In Vitro Diagnostics focuses particularly on IVDs for priority diseases and their suitability for use in resource-limited settings. Attaining PQ status means that a device satisfies WHO requirements for quality, safety and performance based upon WHO’s review of a product dossier, laboratory evaluation of the product, and inspection of a manufacturing facility. The WHO has developed numerous guidance materials, including technical guidance for manufacturers, guidance on post-market surveillance and guidance on procurement and product selection of IVDs. Additional information about the prequalification assessment can be found here. It is essential that POC IVDs are evaluated independently of the manufacturer for an unbiased assessment of their performance. To simplify processes, MOH partners and regulatory agencies are advised to use the results of product evaluations from other countries to grant regulatory approval in their own countries, accelerating the process for countries to approve and introduce new products. For early infant diagnosis, one of the challenges is that while evaluations of new IVDs for EID are essential to inform national regulatory approval and implementation, the low incidence of HIV infection in infants limits the ability to have adequately-sized evaluation studies. To address this challenge and to generate evidence to support EID POC implementation, the EID Consortium was established as a multi-stakeholder effort to help accelerate the evaluation of EID POC IVDs through pooling data from field evaluations. 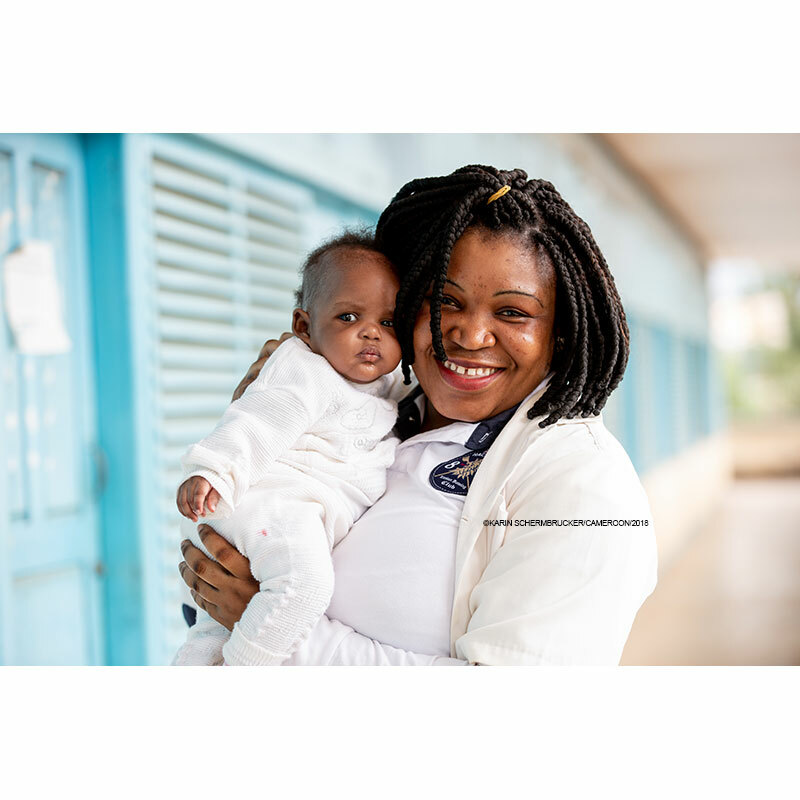 The EID Consortium has conducted pooled analyses of the field performance of POC HIV testing for early infant diagnosis across 6 countries in sub-Saharan Africa (Kenya, Malawi, Mozambique, Tanzania, South Africa and Zimbabwe). Analysis of the data shows that both the Alere q HIV-1/2 Detect and Cepheid Xpert HIV-1 qualitative assays perform well in the field with high sensitivity and specificity, and relatively low error rates (4-7%). In addition to informing national regulatory approval and registration, this pooled EID data, combined to the results of the WHO prequalification assessment and listing of these platforms can also help guide implementers, partners and healthcare workers as they plan for the introduction and roll out of POC IVDs. Wherever an evaluation is required, scientifically sound evaluation protocols should be used for evaluations of new IVDs. The International Diagnostics Centre at the London School of Hygiene and Tropical Medicine contains various resources on diagnostic tools, including generic protocols for a POC EID Test Evaluation and POC HIV Viral Load Assay Evaluation. National registration of manufacturers and their products is viewed as a basic regulatory requirement for any IVD. Manufacturers seeking national approval for a given IVD are generally required to supply a dossier to the appropriate national regulatory authority, describing the IVD and documenting evidence relating to the quality of the manufacturer, as well as the safety and stability of the components, including analytical studies and clinical evidence. Current regulatory oversight of IVDs in low and middle-income countries however is highly variable, and the pathways for regulatory approval are not always clearly defined. Harmonizing regulatory processes across countries, where mutual reliance and/or recognition allows products registered in one country to be registered in another, can help facilitate national approval and registration processes. For additional information, see Improving Access to New Diagnostics through Harmonised Regulation: Priorities for Action. Post-market surveillance aims to ensure that IVDs continue to meet the same quality, safety and performance requirements as when they were initially placed on the market. WHO has developed normative guidance on post-market surveillance of in vitro diagnostics, emphasizing the importance of both reactive post-market surveillance and proactive post-market surveillance activities. Reactive post-market surveillance refers to activities undertaken after an issue has occurred related to the IVD test (e.g., complaint reporting/monitoring; end user quality control programs, etc. ), whereas proactive post-market surveillance refers to scans for potential issues related to the IVD (e.g., pre- and/or post-distribution lot testing). Lot testing involves testing samples from a manufacturing lot to ensure performance meets an acceptable standard. A strong quality assurance (QA) system is critical for ensuring the accuracy and precision of test results produced through POC diagnostic technologies. QA for POC testing has many components, including internal quality control, external quality assurance, data connectivity, and strong supervision and mentoring. The POC Quality Assurance Budgeting Tool, developed by Clinton Health Access Initiative (CHAI), is an excel-based tool that is designed to help countries model the cost of a comprehensive QA program. It is composed of eight approaches to providing QA for diagnostic equipment. These include internal controls; mentorship; external quality control proficiency testing (international and national); duplicate testing; data management through connectivity; paper-based external quality assurance; and e-modules. Both guidance and a version of the tool with mock data are available to support countries with use of the tool. The Stepwise Process for Improving the Quality of HIV-Related Point of Care Testing (SPI-POCT) Checklist, developed by the U.S. Centers for Disease Control and Prevention (CDC), is designed to provide guidance, identify gaps, and provide data to guide policies and processes for improving the quality of POC testing. The SPI-POCT checklist is designed for any instrument-based POC device (e.g. early infant diagnosis, CD4, viral load) and builds from the WHO/CDC Handbook, Improving the Quality of HIV-Related Point of Care Testing: Insuring the Reliability (listed below). The checklist can be used to assess and certify sites prior to testing and throughout testing implementation. This checklist may be best suited for use on a quarterly or every 6-month basis. Whereas the above CDC SPI-POCT checklist may be most useful for standardized site assessment and certification, the Elizabeth Glazer Pediatric AIDS Foundation’s (EGPAF) monitoring guidance and checklists may be most useful for more frequent routine site or district-level supervisory monitoring efforts. EGPAFS’s Site Monitoring Guidance and Checklists (Hub, Spoke, Stand-alone) are useful instruments for routinely monitoring the quality of POC Early Infant Diagnosis (EID) implementation in both hub-and-spoke and stand-alone testing sites. “Standalone” sites contain a POC EID platform, but do not have spoke sites providing samples. With hub-and-spoke models, hub sites contain a POC EID platform, and are linked with spoke sites. Spoke sites do not contain a POC EID platform, but rather send their samples to their associated hub site for testing. The guidance contains information on how to conduct the site monitoring visits and use the site checklists. Improving the Quality of HIV-Related Point of Care Testing: Insuring the Reliability and Accuracy of Test Results, developed jointly by CDC and WHO, is a handbook which provides a framework that promotes and ensures quality assurance for HIV-related point-of-care testing. The handbook details a three-phased quality assurance cycle that can help health-care providers and stakeholders with planning, implementing, and sustaining quality assured HIV-related POC testing. The Toolkit is primarily intended for country program managers. Other stakeholders including policy makers, implementing partners, donors, procurement and logistics personnel, and training and quality assurance personnel may also find this Toolkit useful. The Toolkit was developed through a joint inter-agency consensus building and review process initiated in November 2016. Partners and stakeholders who contributed to the development of the Toolkit include the African Society for Laboratory Medicine (ASLM), U.S. Centers for Disease Control and Prevention (CDC), Clinton Health Access Initiative (CHAI), Foundation for Innovative New Diagnostics (FIND), Office of the U.S. Global AIDS Coordinator and Health Diplomacy (OGAC), Elizabeth Glaser Pediatric AIDS Foundation (EGPAF), London School of Hygiene & Tropical Medicine/International Diagnostics Centre (LSHTM/IDC), International Center for AIDS Care and Treatment Programs (ICAP), Médicins Sans Frontières (MSF), Solthis, Unitaid, UNICEF, the United States Agency for International Development (USAID) and the World Health Organization (WHO). Are there other useful resources available for countries to learn from? Yes. 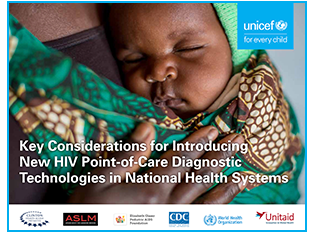 Although not specific to POC technologies, a group of partners and stakeholders have identified and developed tools that would assist programs in scaling up HIV viral load testing. The HIV Viral Load Scale up Tools are available online through the African Society for Laboratory Medicine. How can you provide feedback on the Toolkit? To provide feedback on this Toolkit or to share tools from your country context, contact Alex Costa at UNICEF (alecosta@unicef.org). This project is made possible thanks to Unitaid’s support. Unitaid accelerates access to innovation so that critical health products can reach the people who most need them.